Not to rain on anyone's parade, but iOS devs can afford rents in the Vallery, while Android ones, whose apps enjoy much more downloads, are scraping the bottom of the revenue barrel, and just one look at this chart will tell you why. US is the largest iOS spender, 'Murica! Ever wondered why a lot of iOS apps or Apple services first get released in the USA, and then rolled out globally or stay exclusive? Well, collectively, Americans are the biggest iOS spenders, throwing $36 billion at Apple's virtual app store during its lifetime. China isn't far behind, though, and will probably soon surpass the US as the largest app market for Apple. App Annie ranked the all-time most popular apps and games for iOS by the number of downloads, and revenue, too. 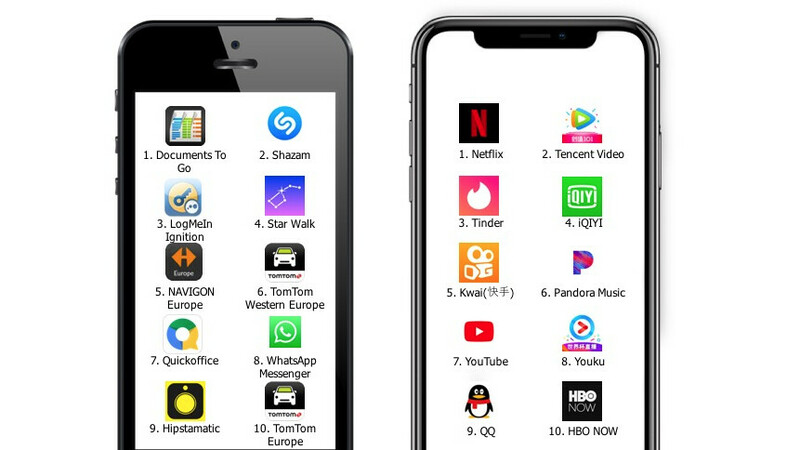 As you can see, subscription services like Netflix, Spotify, and even Tinder, bring the big bucks for Apple when it comes to apps, yet games account for the whopping 70% of the App Store revenue, play on! Last but not least, here is the promised timeline of the most popular apps in the years 2010-2018 (2014 will shock you!). We kid, but it's heartwarming to observe Talking Tom Cat and Documents to Go occupying first places in 2010 - retro mania indeed. Does anyone remember the game "TapFish"? It was such a great game at the time and seems like it's gone.